It’s the sad truth about espionage and terrorism: it’s a perpetual cycle of suffering and violence and death, a slow-changing situation in which our enemies are willing to do whatever it takes to kill us. And like Quinn bitterly asks near the beginning of the episode, “What strategy?” What exactly are we doing? We seem to be avoiding the brutal truths of foreign intervention, convincing ourselves that we’re always doing good work and always holding our people in the highest regard. In the end, though, people are going to get hurt, and the question becomes whether it’s worth it or not. What Homeland understands is that this battle against terrorism seeps into every little crevice of the government, that what we’re left with is an institution that sometimes behaves in similar manners as its enemies. 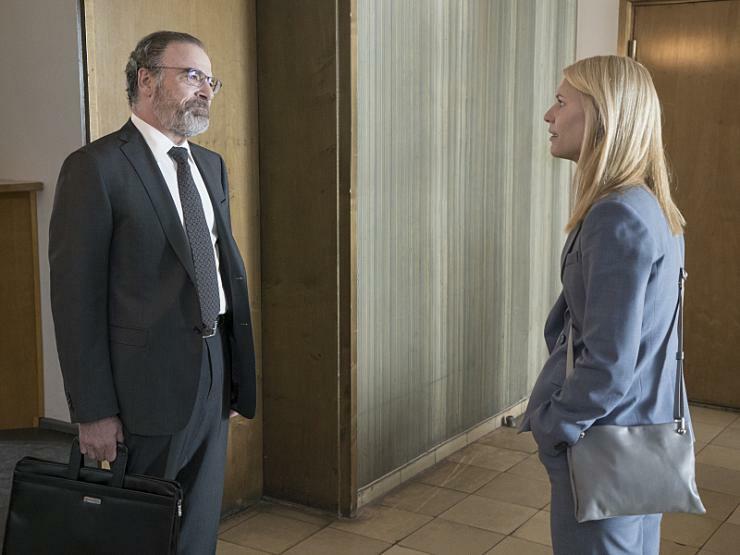 And so, as we move into season five of Homeland–this show could use a set end date, Showtime–Carrie Mathison is trying to leave all of that behind. She’s living in Berlin with her boyfriend and daughter, she’s not trying to drown any babies anymore, and she’s working security for Otto During. Of course, as expected, she ends up getting pulled back into the thick of things, and she tells her boyfriend: “It’s like my old life came back…everything I moved here to get away from…I don’t want to be in that world.” It’s not quite so easy to distance your personal life from your professional life, though, or your present life from your past. As a former CIA agent, Carrie experienced those difficulties firsthand. No “clean break” for her, I’m afraid. This is where the show connects her to the rest of the characters: at the intersection of her old and new lives. The scene between her and Beautiful Bearded Saul carries the weight of the past, the latter accusing the former of turning her back on her entire life. There’s a significant amount of tension here, and as always, Danes and Patinkin play off of each other extremely well. It’s a bit of a new direction for the two, and although certain dynamics we see in the premiere by no means feel new, hopefully the season can tie in new and old characters to create a nice emotional through line. That way, it can be a more well-rounded season, the characters and spy intrigue working in tandem to craft entertainment. – “You’re being naive and stupid, something you never were before.” UHHHHHH. -Quinn nailed it on the head about Syria. – “You spent the last 10 years killing people; it’s not enough to just stop.” Can’t escape your past. -Not entirely sure about regular coverage this season. For all its flaws, I’m finding The Leftovers to be much more interesting to write about, so that has priority for now. We’ll see. Thanks for the write up – The Affair, Homeland, and The Left Overs – plus Madam Secretary and Quantico. Too much TV and too little time. I ended up watching Homeland on Monday morning. I am still a bit unclear. – how did the hackers who made the gag video which they uploaded to the Jihadi website – get the wires crossed with the CIA. Okay if the CIA is tracking that website, then they become aware of the gag video up load. So they start to trace the hackers with pings and what not. But the hackers amp up their computer power which enables them to gain access to the CIA files. They download 1361 files before the CIA is able to fully shut down. The explanation was kind of glosssed over – but as Saul told his German counterpart – we fucked up. Just wondering if you can offer a bit more? I’m afraid I’m not entirely sure either. Apparently the club servers had more power than the CIA’s there? An in depth explanation was definitely glossed over there. Good start to the season. Quinn was great and Carrie wasn’t too annoying which is a plus. I enjoyed Season 4 (minus the end which they run away from here it seems with the time jump), so I’m hoping that this can be another enjoyable year for the show. Too much TV on Sundays. I still need to get to the other two shows you reviewed!